Business analysis is the set of tasks and techniques used to work as a liaison among stakeholders in order to understand the structure, policies, and operations of an organization, and to recommend solutions that enable the organization to achieve its goals.Business analysis involves understanding how organizations function to accomplish their purposes and defining the capabilities an organization requires to provide products and services to external stakeholders. It includes the definition of organizational goals, understanding how those goals connect to specific objectives, determining the courses of action that an organization has to undertake to achieve those goals and objectives, and defining how the various organizational units and stakeholders within and outside of that organization interact. 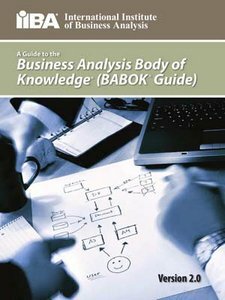 A Guide to theBusiness Analysis Body of Knowledge® (BABOK® Guide) contains a description of generally accepted practices in the field of business analysis. The content included in this release has been verified through reviews by practitioners, surveys of the business analysis community, and consultations with recognized experts in the field. In less than five years, the BABOK® Guide has been recognized around the world as a key tool for the practice ofbusiness analysis and become a widely-accepted standard for the profession, with over 200,000 copies downloaded from the IIBA® website. Version 2.0 represents a major advance on that standard, and will become an essential reference for business analysis professionals.